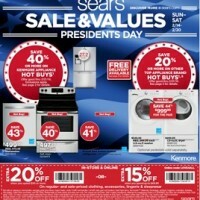 Sears is an American multinational mid-range department store chain headquartered in Hoffman Estates, Illinois. 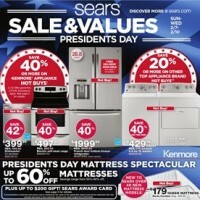 The official name of Sears is Sears, Roebuck & Co. The company was founded by Richard Warren Sears and Alvah Curtis Roebuck in 1893 as a mail order catalog. In 1925 it began opening physical stores. 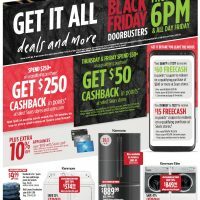 It was formerly a component of the Dow Jones Industrial Average before being bought out by Kmart, forming the Sears Holdings Corporation in early 2005. As of 2005, its main rivals are JCPenney, Belk and Macy’s. Montgomery Ward was a former rival until 2000. The first Sears retail store opened in Chicago on February 2, 1925 in the Merchandise building (in a portion of the company’s headquarters at Homan Avenue and Arthington Street). This store included an optical shop and a soda fountain. The first freestanding retail store opened October 5, 1925 in Evansville, Indiana. During the summer of 1928, three more Chicago department stores opened, one on the north side at Lawrence and Winchester, a second on the south side at 79th and Kenwood, and the third at 62nd and Western. In 1929, Sears took over the department store business of Becker-Ryan Company. In 1933 Sears tore down the old Becker-Ryan Company store in Englewood, and built the first windowless department store, inspired by the 1932 Chicago World’s Fair. From the 1920s to the 1950s, Sears built many urban department stores. Starting in the 1950s, the company expanded into suburban markets, and malls in the 1960s and 1970s. In 1959, it had formed the Homart Development Company for developing malls. Many of the company’s stores have undergone major renovations or replacement since the 1980s. The company was the largest retailer in the US until the early 1980s, but had dropped significantly in rankings by the time it merged with Kmart. Sears began to diversify in the 1930s, adding Allstate Insurance Company in 1931 and placing Allstate representatives in its stores in 1934. Over the decades it established major national brands, such as Kenmore, Craftsman, DieHard, Silvertone, Supertone, and Toughskins. 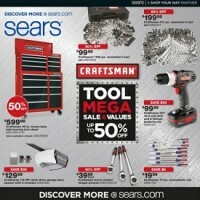 In 1993, Sears stopped production of its general merchandise catalog because of sinking sales and profits. Sears Holdings continues to produce specialty catalogs and reintroduced a smaller version of the Holiday Wish Book in 2007. 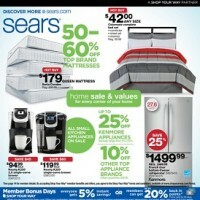 On iWeeklyAds you will find the latest Sears weekly ad and weekly circular, online, on a single place.